When it comes to the art of teaching, most professors have a few tricks up their sleeves, and Dr. Michael Tallon is no exception. In fact, he has an entire repertoire of card tricks and other magical feats because in addition to teaching first-year Spanish, he is also a recognized master magician. Specializing in “close-up” magic, Tallon was recently awarded a 'Doctor of Magic' at one of the foremost magic meetings in the world, the Close-Up Magic Convention. Although he is the first to tell you that it is a “fun” degree, it is obvious that earning it took as much study and dedication as his other newly conferred degree: a Ph.D. in foreign language education from The University of Texas at Austin. He received both degrees within weeks of each other this past spring. Careful to keep his extracurricular talent under wraps, Tallon says that most of his students do not know he is a magician. If they did, “they would want to see magic every class.” Instead, he keeps his performances for special occasions or the last week of classes before final exams. It not only adds a little fun to the everyday, but also can help ease his students' anxiety -- something he has studied in depth, as his dissertation examined foreign language anxiety in students of hispanic heritage. One might think that teaching Spanish and performing magic are worlds apart. But according to Tallon, they are merely different sides of the same coin with many similarities between the two. For example, both professions require stage presence as well as a knack for presentation. But most importantly, says Tallon, it's vital to be able to establish a good rapport with your audience - whether in the classroom or on the stage - that is based on mutual respect. 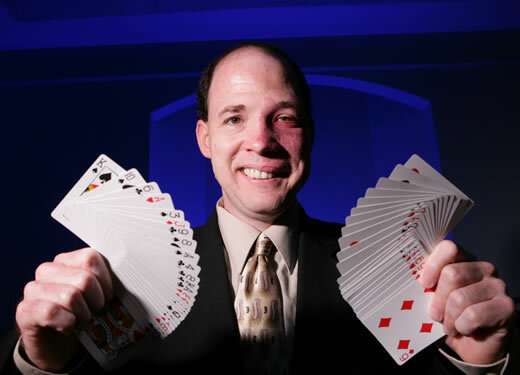 Tallon's current expertise is in “close-up” magic, which focuses on sleight of hand and is performed up close for just a few people at a time. There are several other forms of magic, including the stage magic of Las Vegas and TV, in which illusions are performed in front of large audiences; mentalism, or mind reading; and parlor magic, which is performed for groups of 40 to 60 people. 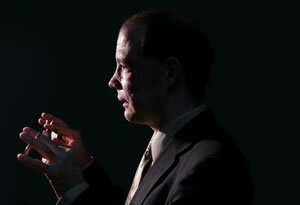 “Close-up magic’ is all about doing a few of your best tricks quickly, and then you're gone. Although a close-up performance may only last a few minutes, it takes many, many hours to perfect each trick,” Tallon says. He should know. He spent six years as the house magician for a local San Antonio bar, performing tableside and amazing the patrons with seemingly impossible feats involving cards, coins, rubber bands, napkins, and other ordinary objects. Once you spend time with this earnest and soft-spoken magician, it is easy to understand how his commitment to perfectionism has resulted in his winning first place in several magic contests and being named Magician of the Year by the International Brotherhood of Magicians. But his greatest achievement to date has been receiving the much coveted invitation to perform at one of the world's most prestigious close-up magic conventions, Fechter's Finger Flicking Frolic. Only 200 or so magicians are invited to attend each year and each performance earns a degree, with a 'Doctor of Magic' the top honor after three performances. In his dual role as professor-magician, it's not surprising that Tallon's first performance at Fechter's was more than entertainment - it taught a lesson in teamwork as well. He says that his was the closing act of one of the formal close-up shows, as well as the first performance of the convention to receive a standing ovation. Even though the magicians watching Tallon's performance at Fechter's knew the trick's mechanics, they didn't expect Tallon's twist. The act began with Tallon and a magician friend attempting to outdo each other's magic as they asked, “Can you do this?” Seeing that neither could outdo the other, they then performed their cups and balls trick in tandem and choreographed to music. Their movements were perfectly synchronized as the small balls appeared and disappeared under each other's set of cups without a single mistake - and a surprise ending not typically seen in a cups and balls routine. “We were showing that in magic, as in life, it is better when you work together,” Tallon explains. He also says that magicians are a very close-knit group with a strong code of ethics that promotes sharing and positive support. For example, they sign an oath that they won't expose magic, nor will they disparage fellow magicians in front of others. During his short 10 years in magic, Tallon has been active in two local magic clubs, holding a variety of offices. He currently is vice president of Ring 18 of the International Brotherhood of Magicians and lecture liaison for Assembly 52 of the Society of American Magicians. And like many magicians, his interest in magic was first sparked as a teen when a friend showed him some card tricks. He immediately bought a few magic tricks from the local magic store and the rest, as they say, is history. “Magic enables us to become almost childlike again, allowing us to forget our everyday problems, if only for a moment. I enjoy seeing the expression of astonishment on people's faces when they see the impossible, and that continues to motivate me,” Tallon explains. With loyal fans around campus, Tallon has many opportunities to reap enjoyment from entertaining others. Take Dr. Denise Doyle, vice president for academic and student affairs, for example. She says she asks to see a card trick each time she runs into Tallon, and she's never been disappointed. What do the stars hold next for Tallon? He plans to continue doing what he loves most -- teaching at the university, where he appreciates the sense of family and student-focus not found at larger institutions. And now that he no longer commutes to Austin for graduate classes, he will have more time to devote to magic and possibly move on to specializing in a new variety: parlor magic.